Franklin Wrap was developed at Franklin Memorial Park located in North Brunswick, New Jersey. During the construction of our new Chapel of Serenity Mausoleum complex, we knew we needed to address entombment issues we were having in our current building. We went into research and testing to develop a more affordable product to address leakage and crypt gnat problems we have had in the past. 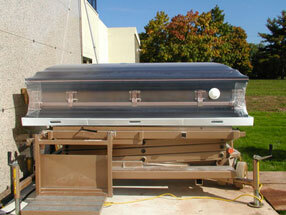 The solution was Franklin Wrap, a casket protector sealing system for a worry free entombment. The casket you see on the right has been sealed and is now ready for a worry free entombment. The "white circle" you see towards the end of the casket is our 2 way filter that is attached to the surface of the wrap! This filter allows the casket to "breathe" and at the same time is impenetrable to crypt gnats.